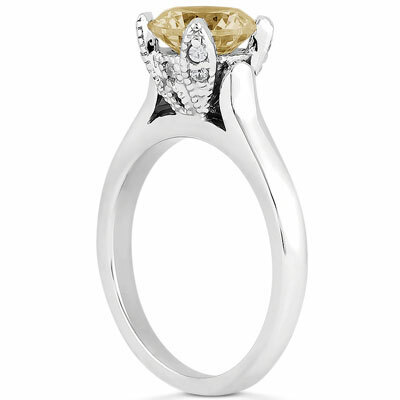 This 14K white gold smoky quartz and diamond accent solitaire engagement ring combines an understated sophisticated gemstone and a floral-inspired setting to create a look that's a chic symbol of love in bloom. A round 6mm smoky quartz, a semi-precious stone with a unique brownish-gray glimmer, is held by four petals of 14K white gold, each of which is elegantly accented with milgrain and tiny diamonds. This sophisticated flower sits elegantly on a gleaming band as it declares your affection. 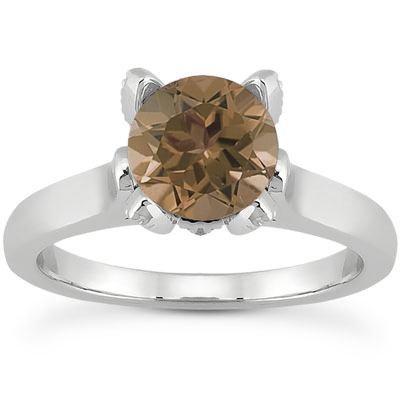 An 6mm smoky quartz is held by four petal shaped prongs with diamond accents in 14K white gold. Also available in 14K Rose Gold, 14K Yellow Gold by request. We guarantee our Smoky Quartz and Diamond Accent Solitaire Engagement Ring to be high quality, authentic jewelry, as described above.